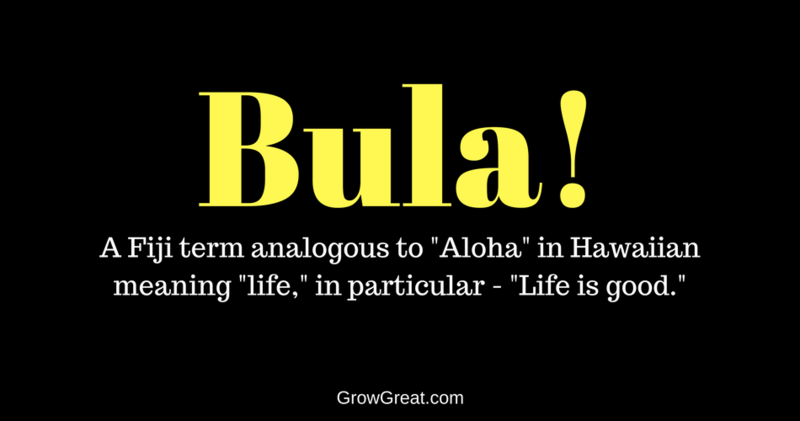 Over 30 years ago I ran across the term – Bula. I don’t remember where. I do remember instant fondness for the term because it carried the connotation that “life is good.” How can you not like that? I was so smitten with the term that I began to use it as the greeting on internal memos in the company I was operating. Bula! A single explanation took care of it. After that, everybody instantly remembered the meaning of the word. High performers are not only driven, but they’re optimistic. Hopeful. Always chasing a better outcome, an improved version of themselves and a place of higher accomplish. In short, the best performers know that growth and improvement are possible, even probable. They all have another common trait: willingness. They’re willing to do the work. Willing to do what’s necessary to make it happen. Willing to be responsible and practical. Willing to be patient, realizing that growth takes time. Willing to acknowledge the power of compounding, in everything. But there’s a contradiction because they’re also unwilling. Unwilling to pursue something they don’t believe in. Unwilling to follow every rule. Unwilling to sacrifice their strengths in order to pursue some weakness. Unwilling to let their lives be ruled by dread. Unwilling to let a single day go by without finding reasons to be optimistic. For over 2 years I’ve been holding out optimism as I noodled with an idea of serving just a few small business owners. Optimistic that I could make a meaningful impact on the lives of perhaps a few dozen small business owners. Not by holding forth, or being the answer-man to all their problems, but knowing — and believing — in the collective power of small groups of peers (other small business owners) who together could wrestle down problems, more closely exam opportunities and enjoy a depth of relationship designed at learning, growth and improvement. Magical things happen when you put yourself around optimistic people. The reason is simple: optimism is rare. Negativity is the order of the day. Slamming politicians, blaming the government, finger pointing, shouting — those are the habits most often displayed. They wear on us. In time, we join in. Sometimes not even realizing it’s happening. We moan and complain. We find excuses for our failures instead of celebrating them as efforts in an attempt to find out way, and figure it out. It’s wearisome, robbing us of life, much less a good life. The losers around us don’t help. They quickly provide ample reasons why our optimism is unfounded. Even foolish. They reason with us about the latest legislation that will certainly be bad for our business. Or the looming disruptive technologies sure to hurt our company. They yearn for how things once were and cheer us on to join their chorus. Sometimes we do. Sometimes we romanticize the past glory we may have once enjoyed. And get lost in our daydreaming of wondering what happened. Life is good. Worth celebrating, and even more worth being thankful for. Add to this list. Go ahead. I know you’ll be able to do it. And quickly, I’ll bet. You get the drift. We’d be here all day and all night if I merely listed them all. The same goes for you. I don’t care how bad you think things are, or how good. We’re all ridiculously blessed. Life isn’t fair or equal. It just IS. Build your bridge and get over it. That doesn’t mean we accept our current state as being our “fate.” Hogwash. No such thing. Fate is what we make it. Henry Ford was right in that notion about whether we think we can, or we think we can’t – either way, we’re right. We don’t like to think that’s so when we’re down and out. We want to think it’s somebody else’s fault. Surely it’s not on us! Yes, it is. If one little phrase has permeated my life over the last decade, it’s this one: own it! Not that I’ve always done it, but that I know I need to always do more of it. Optimism helps. Fact is, optimism helps EVERYTHING. That’s that why I want to focus your attention on it today. And I’m doing it with a purpose…primarily to show you that it may be time to get out of your own head and into a room where you can share experiences, stories, concerns, worries, opportunities and celebrations with others. People who committed to their own quest for optimism. People determined to not stop growing, learning or caring. People who understand they need people. When I was a boy Barbra Streisand hit the world by storm. In 1964 she performed a monster hit song, People. It was true in 1964. It’s true in 2017. And if the world stands, it’ll be true 100 years or 1000 years from now. Our lives are made better by people. We all know this is true yet we somehow remain isolated with our own thoughts and demons. We go it alone when we could so much more easily go it with others. When we do, our optimism soars and it changes everything. Because we surround ourselves with others who believe we feed our own optimism, which in turn feeds the optimism of those we’re hanging with…and together we all find new heights for ourselves. Have you ever been fascinated by the stories of actors, singers or comedians who talk about their early years? Those years of toil, struggle and hardship. Do you think it’s coincidental that some of the biggest names you’ve heard of in those arenas are people who “came up together” with other big names? No. There’s a method to that madness. For starters, they all had some degree of talent for the game, whichever game it may have been – acting, musicianship, comedy. Secondly, they all were committed to make it. They worked hard, put in long hours, did whatever they could to survive while they were making it. Thirdly, they all endured the grind because they loved what they were doing. Success takes however long it takes. Some took longer than others. That’s life. Fourthly, they maintained the belief – and determination – that they’d make it. Optimistic that eventually, it would be reality. Barbra Streisand left home before her 18th birthday. She lived like a gypsy and her mother would lament how she was choosing to live. Her mom’s disbelief fueled Barbra’s belief. As the universe grew pessimistic, she grew more optimistic displaying an “I’ll show you” attitude. Her enormous talent wasn’t going to be enough – it never is. It would require people in her life propping her up, encouraging her, helping her. That combination made her a star. And even then it took time. But had she gone it all alone, it may have never happened. This isn’t restricted to creative endeavors like acting, music or comedy. It’s universal. You’ve seen it in your life and in the lives of people you know. One person makes an impact. One person willing to be candid with us because they’re helping us – not because they’re judging us. One person willing to encourage us because they believe in us, not in what we’re doing! And if we’re very lucky, more than one person comes along in our life willing to do for us what we can’t do for ourselves. It’s that belief that has driven me for two years to reach this point – a point where I’m pushing all the chips into the middle of the table to bet my professional future on a belief that I can help put people in a virtual room together so they can find new levels of achievement they’ve not yet experienced. In business. In life. Financial. Emotional. Across all spectrums of our lives because we’re not singularly-focused people. We’re complex and our lives often times seem even more so. It’s about YOU. Your life. At work. At home. When you goof around, or when you’re at your soberest. It’s about YOUR BUSINESS. The daily challenges. The special challenges. The constraints and the opportunities. It’s fueled by one foundational idea – that no matter how things are right now, they can be improved. That with the help of others we can reach summits we may have doubted even existed. Fun. Let’s not overlook a major benefit of optimism. It’s just more fun than being negative. It’s more fun to consider how great things will turn out, than to fret about how awful it may be if they don’t. I’m currently looking for 14 small business owners who share my beliefs. Fourteen people who know they can grow, learn and achieve more than they’ve ever achieved if only they could be surrounded by 7 other people who were like-minded and willing to put in the work that optimistic people know is required. Fourteen people who aren’t satisfied with being surrounded by people more interested in finding excuses than opportunities to learn and improve. Fourteen courageous people willing to step forward with a commitment to grow their business and to grow their own leadership so they can be a more positive influence in the lives of others. What have you got to lose? Nothing but your negativity and those things holding you back from soaring as high as you can.